The ABC 7 I-Team has obtained the official reports and recordings from airport police and they paint a different picture of the incident. CHICAGO (WLS) -- The ABC 7 I-Team has obtained the official reports and recordings from airport police and they paint a different picture of the incident. Chicago Aviation police reports obtained by the I-Team describe United passenger David Dao, 69, as combative, aggressive and starting to fight with officers. 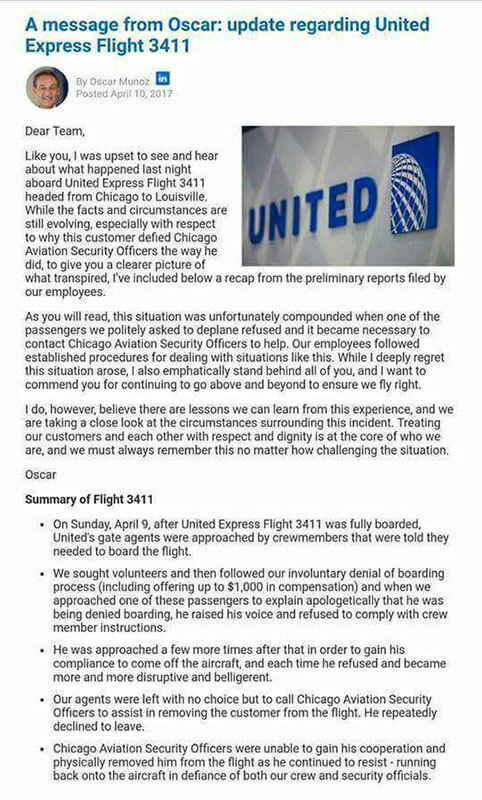 Doctor David Dao and his wife had boarded united 3411 for their flight home to Louisville. When word came that United wanted four passengers to deplane so crew members could take their seats, authorities said Dao refused to leave. "A few passengers are refusing to get off the aircraft when instructed by the agent and also supervisor," the recording said. That is how it started, according to the police report obtained under an I-Team FOIA. Three aviation police officers tried to talk Dao into leaving and when he repeatedly refused, they forcibly removed him. A Facebook video appears to show a passenger being forcibly removed from a United Airlines flight Sunday evening at O'Hare International Airport. The scenes in the viral video show Dao being dragged off and hitting his head in the process. According to police, "Mr. David Dao yelling about leaving, repeatedly in an aggressive manor, flailing his arms, starting to fight with officers." While they are removing him, officers said Dao is "able to knock an officer's hand off his arm, causing the officer to lose control and Dao to fall and hit his mouth." An aviation officer reported Dao said, "I'm not getting off the plane, just kill me. I want to go home." That was reiterated by the captain who reports Dao "was spitting blood saying I'm going home just kill me." Aviation police officers Mauricio Rodriguez, Jr., Steven Smith and James Long tried to talk Dao into leaving initially, though he refused. Long was the officer seen physically removing Dao in the viral video. Rodriguez and Smith were on the job about a year and Long had been an aviation cop less than two years. At the time of the United incident, Long had just come off suspension a few days earlier, according to police records, for insubordination. He allegedly ignored an order to secure an airport entrance. Chicago attorney Tom Demetrio said Dao has a significant concussion and plans to sue the airline. As for the implication in police reports that Dao caused his own injuries by being combative, Demetrio told the I-Team, "It's utter nonsense. Consider the source." Dao hired powerful Chicago attorneys. Thomas A. Demetrio, co-founder of Corboy & Demetrio, and Stephen L. Golan, managing partner of Golan Christie Taglia, are representing him. The daughter of a man dragged off a United Airlines flight at O'Hare Airport spoke on behalf of her family Thursday. READ MORE: Who is Dr. David Dao? The I-Team attempted to reach all three aviation officers. When asked Monday night about Rodriguez, Smith and Long, officials from their union said they would "reserve further comment...until the investigation by both parties is completed." The statement notes that aviation officers "receive the same training as members of the Chicago Police Department as well as nearby municipalities in Illinois." The investigation into the incident on board United Flight 3411 is still underway by both the union and the Chicago Department of Aviation. We will reserve further comment about this particular incident until the investigation by both parties is completed. The more than 300 Aviation Officers who serve and protect our airports are state-certified law enforcement officers and receive the same training as members of the Chicago Police Department as well as nearby municipalities in Illinois. Aviation Officers are the first responders to medical, safety, and security emergencies in and around our airports. It was Aviation Officers who stopped those who posed a security threat by breaching TSA security checkpoints in January. They have provided life-saving, first-response EMT services to the traveling public - both in the terminals and on board airplanes - suffering medical emergencies, and it is Aviation Officers who work overnight to make sure that passengers and their families are protected and secure when they are left stranded or inconvenienced due to airline issues. Local 73 and the Aviation Officers look forward to working the Chicago Department of Aviation to make sure there is comprehensive training, policies, and procedures established that address the ever-changing challenges at our airports. United CEO Oscar Munoz promised, in an interview with ABC News, to review policies and promised change at the airline. 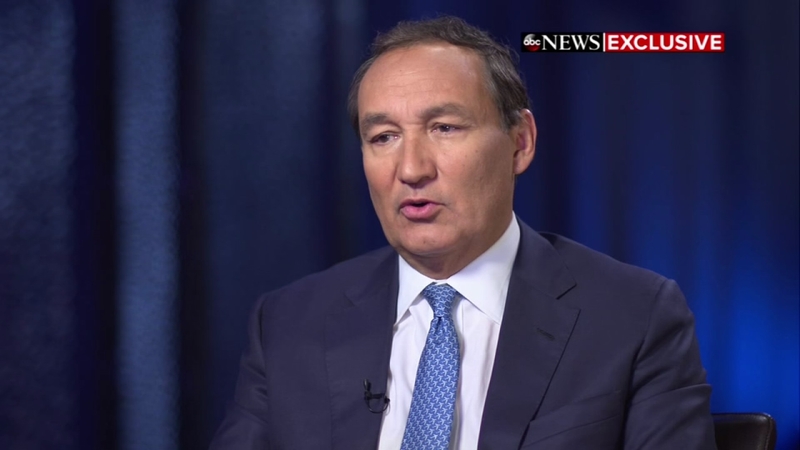 United CEO Oscar Munoz sat down exclusively with ABC News after controversy over the removal of a passenger from an overcrowded plane. In an initial response to the incident, Munoz seemed to blame Dao, describing him as "disruptive and belligerent." He then did an about face, offering Dao a public apology for the way he was treated. Demetrio said Thursday the apology looked "staged." United refunded all the tickets to passengers on board Flight 3411. They can take the compensation in cash or credits. I've heard a lot of understandable anger and disappointment this week from customers and, as one of our most valued customers, I wanted to be sure you heard directly from me. The awful event that occurred on Flight 3411 has elicited many responses from our customers: outrage, anger, disappointment. I share all of those sentiments. For me personally, I'd add shame. No one should ever be mistreated this way. Our customers' satisfaction must be the center of everything we do and your opinion of our service is the measure of our success. We know we did not measure up, and for that we will redouble our efforts to earn your trust. First, we are committing that United will not ask law enforcement officers to remove passengers from our flights unless it is a matter of safety and security. Second, we've started a thorough review of policies that govern crew movement, incentivizing volunteers in these situations and how we handle oversold situations. Third, we will fully review and improve our training programs to ensure our employees are prepared and empowered to put our customers first. Our values will guide everything we do. We'll communicate the results of our review and the actions we will take by April 30. Editor's Note: United Airlines Flight 3411 was not overbooked. Our early reporting on the incident involving Dr. Dao makes reference to the flight being oversold because that was initially believed to be the cause for the removal of passengers. It has since been learned that passengers, including Dr. Dao, were removed to make room for four crew members.